Many years ago as a church planter I was introduced to a simple process using Post-It® Notes to identify all the important things needed to be accomplished in starting a church. Rather than posting the notes on your car where they will likely blow away (see above), you can attach them to a large poster paper. Here’s a great application of this concept to use with your team as you determine how you will make disciples who make disciples. Objective: Identify your primary method for Making Disciplemakers and then create a diagram showing how your major ministry activities contribute to multiplying disciples and disciplemakers. ➢ Show the logical sequence by which a person is introduced to faith in Jesus and their next steps in following Jesus. ➢ Include the intended result of each step. ➢ Identify any essential steps that are missing. ➢ Determine what is required to move people toward becoming disciplemakers. 1. Write your Disciplemaking Engine on a large Post-It® and place in the middle of the page. 2. 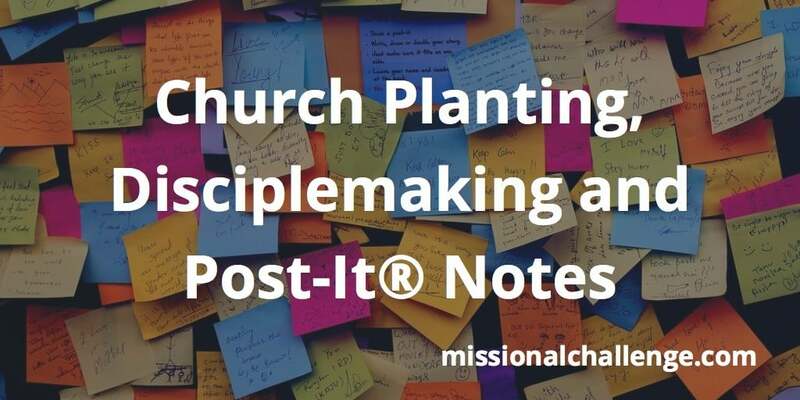 List each major step in your disciplemaking pathway on a Post-It® Note. 3. Organize each ministry/activity in a logical order on a poster. In what sequence do people typically progress as disciples? How will we… seize the mission? act like missionaries? exegete the culture? incarnate the gospel? meet needs? find Persons of Peace? present the Good News? baptize? teach to obey? train to make disciples? form communities? celebrate? mobilize teams? develop leaders? 5. Identify any unnecessary ministry activities. 6. Consider what level of commitment is required for involvement at each step. 7. Determine the communication and relationships required to move people to the next level of commitment and involvement. 8. Use arrows to connect your ministries, steps, and activities to create “flow” to move people toward spiritual reproduction. ➢ Reflect our core values and habits? ➢ Identify a clear path to connection / community? ➢ Factor in the importance of obedience? ➢ Align with the mission of Jesus? NOTE: The forms and pathway for disciplemaking must be unique to your context. Understand the priority of disciplemaking to all church planting activities. After describing your primary method of making disciplemakers, connect all other activities toward this outcome. Awesome post… I love the creative way of being able to visualize the process. What Makes a Coaching Question Good? Ask: Who Am I Discipling?